High-grade granitoid gneiss terrains form the second main type of Archean terrain. Examples include the Limpopo belt of southern Africa, the Lewisian of the North Atlantic Province, the Hengshan of north China, and some less-well-documented belts in Siberia and Antarctica. The high-grade gneiss assemblage seems similar in many ways to the lower-grade greenstone belts, but more strongly deformed and metamorphosed, reflecting burial to 12.5-25 miles (20-40 km) depth. Strongly deformed mylonitic gneisses and partially melted rocks known as migmatites are common, reflecting the high degrees of deformation and metamorphism. Most of the rocks in the high-grade gneiss terranes are metamorphosed sedimentary rocks, including sandstones, greywackes, carbonates, as well as layers of volcanic rocks. 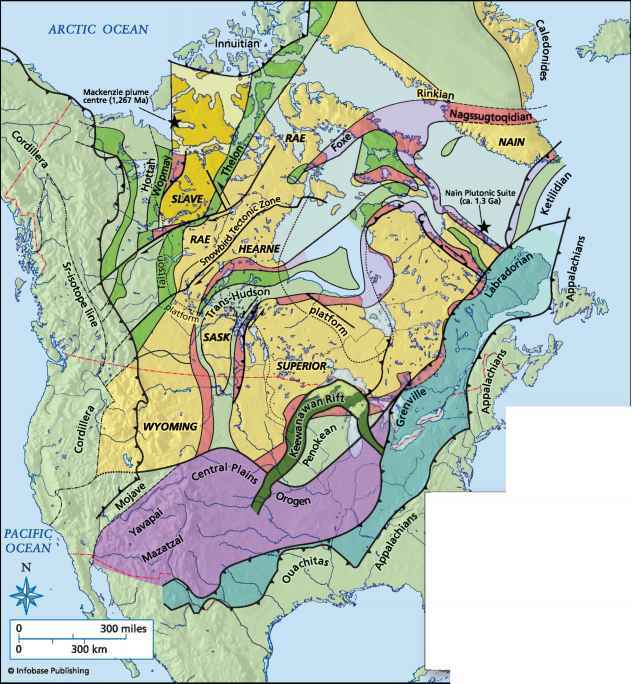 Many are thought to be strongly deformed continental margin sequences with greenstone-type assemblages thrust over them, deformed during continent-continent collisions. Most high-grade gneiss terrains have been intruded by several generations of mafic dikes, reflecting crustal extension. These are typically deformed into boudins (thin layers in the gneiss), making them difficult to recognize. Some high-grade gneiss terrains also have large layered mafic/ultramafic intrusions, some of which are related to the mafic dike swarms. The strong deformation and metamorphism in the Archean high-grade gneiss terranes indicates that they have been in continental crust that has been thickened to double crustal thicknesses of about 50 miles (80 km), and some even more. This scale of crustal thickening is typically associated with continental collisions and/or thickened plateaus related to Andean-style magmatism. High-grade gneiss terrains are therefore typically thought to represent continent-continent collision zones.